Original article appeared in our September 2016 Newsletter. It takes us to work, hauls the kids to school, and totes our groceries. It’s subjected to scorching heat, freezing ice, and every kind of weather in between. Without it, life would be a lot more complicated. I present to you the ubiquitous automobile. Once considered a toy for the rich and powerful, mass production methods made cars available to the general population. Since the early 1900s, this piece of machinery changed not only how we travel, but life as we know it. There’s no denying the call of the open road. The 4 million miles of public roads in the United States offer a freedom that’s hard to match. Most of us have childhood memories of that thing we call a “family vacation.” It involves piling everyone and only their “most essential” belongings into the family vehicle for the seemingly never-ending cross-country trek to somewhere or some obscure relative. 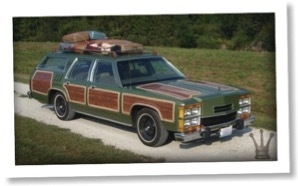 Traveling by car/van/Wagon Family Truckster/Vista Cruiser is not the fastest mode of transportation, but it’s readily accessible, the most economical, and indeed the most flexible method. Arrive two hours before departure. Stand in endless lines. Put up with ill-tempered TSA agents eagerly waiting to do full body searches. Pay for going six ounces over the fifty-pound weight limit for luggage. Fahgettaboudit - we’re calling the shots - we’re traveling on our terms. Heck, we can take 50 pounds of shoes if we want! However, we’ll be using our space more effectively by toting 45 pounds of food and only 5 pounds of shoes. Hey, we gotta be comfortable walking around the world’s largest ball of twine, right? A successful trip starts before you even insert the key into the ignition. Planning is an essential part of the equation - it’s even more critical on a gluten-free road trip. I’m going to assume you’ve already had your vehicle checked over and verified its road-worthiness. No one wants a breakdown on the way Neillsville, WI to see Chatty Belle, the world’s largest talking cow. Are you ready to start your gluten-free road trip? Let’s go! It helps to have at least a rough itinerary for your trip. Research the cities you’ll be passing through and visiting. The internet makes this so much easier. If you are near larger cities, it’ll be easier to find grocery stores, farmers markets, and restaurants that will be accommodating. If you are meandering down the less traveled dusty backroads, you need to expect gluten-free options will be less likely - so plan accordingly. Local support groups can be invaluable when it comes to finding trusted sources of food. As you well know, groups and their most humble leaders are amazing resources. Mapping sites allow you to get directions to and from desired locations. Get a bird’s eye view of the area. Create maps with your points of interest in order to quickly see how close or far these spots are from one another. How far is that gluten-free restaurant from our hotel? NOTE: No personal experience with these sites, but will be investigating them closer. Find, Research, and book hotel rooms. I always use TripAdvisor to vet hotels. Guest comments are constructive. Think carefully about the number of days and nights on the road and your “eating opportunities.” Keep in mind, “eating and drinking opportunities” in a car are almost constant. Make sure you have plenty of snacks and H2O on hand. Double bonus points for healthy snacks! We do best if we plan for breakfast and lunch. For dinner, we try to seek out a reputable restaurant - of course - if, at all possible, this is mapped out ahead of time. Many hotels offer free continental breakfasts, but gluten-free options are usually limited to fresh fruit. If you’re lucky, you might find hard-boiled eggs. Luckily, you brought your own! When selecting a hotel, get a room with a microwave and fridge. Having these essential tools on hand makes it a bit more convenient. If you’re staying longer than overnight, find a place with a kitchenette. Of course, this means packing some basic cooking equipment. You’ll want to raid your kitchen or go to the grocery store to lay in supplies for your epic road adventure. You’ll want to pick foods & snacks that are easy to handle, particularly for the driver. Since you’ve already scouted out some potential grocery stores at your stopping points, you can gauge how much food you’ll need to bring along for each leg of your Tour de ‘Merica. Grab your favorite gluten-free crackers, pretzels, bread, snack bars, beef jerky or meat sticks, sandwich meat, packets/cans of tuna, hard-boiled eggs. Make up a cold pasta or tuna salad the night before you leave; this makes for a great lunch the next day. While you’re at it, fry up a pound or two of bacon (crispy please). You’ll be happy you did when you have access to a microwave. Don’t forget your favorite fruits (whole apples, bananas, oranges, grapes, watermelon, cantaloupe, strawberries) and veggies (carrots, sliced bell pepper, broccoli and cauliflower florets, celery, snap pea pods, cucumber slices, cherry tomatoes). No road trip is complete without a big batch of trail mix (a variety of nuts, dried fruits, chocolate chips or M&Ms…and anything else you like - be creative). Prepping some of the foods ahead of time will pay big dividends when you’re out on the road. Washing, slicing, pealing, and packaging foods will make them easier to eat. Put these foods into sealable air/water tight containers - like Ziplock Containers/bags, or Tupperware brand containers. Practice safe-toasting. You’re hankering for a piece of gluten-free toast, but you can’t find a gluten-free toaster anywhere. No problem, toaster bags to the rescue! Minimus.biz offers over 2,500 food & non-food products. A most interesting website! Cooler Hand Luke or Have Cooler Will Travel. A cooler is an essential part of any trip - yes, even day trips! Improper food storage can result in food-borne illness; in severe cases, it can be deadly. Bacteria thrive and multiply quickly in warmer temperatures. The danger zone falls between 40 and 140 degrees. Without refrigeration or a heat source, perishable food should not be left out for more than two hours if the temperature is below 90 degrees. Reduce that time to one hour if the temperature is at or above 90 degrees. Keep cold foods at or below 40 degrees and hot foods at or above 140 degrees. Throw an appliance thermometer in the cooler to keep an eye on the temperature. Coolers come in many sizes, shapes, and materials (soft-sided and hard sided). They range from low-tech styrofoam to hi-tech iceless car battery/AC powered travel coolers and refrigerators. The hard sided coolers offer extended cooling than soft sided. Spend some time researching which type of cooler is right for your needs - it’s worth the investment of time. If you’re going old school with a traditional non-powered cooler, you’ll need to think about the type of ice to use. What?!? Ice is ice, no? Crushed ice or cubes cool items faster, but blocks of ice last longer. Dry ice is also an option, but requires some special handling - we won’t cover that here. Cube ice & water mixture is excellent for cooling beverages, but tends to be messy and doesn’t mix well with food. Soggy food is never good eats. The best option is block ice - even better when the block is inside a container like a plastic bottle or sealable container; this helps in reducing the amount of water in your cooler. The best bottles I’ve found are Simply Lemonade/OJ/Apple Juice/etc. 88.93 and 59 oz. Also Pure Leaf Iced Tea 64 oz. What I like about these bottles - they’re not round and have relatively flat sides - this means better contact with food for maximum cooling. Pure Leaf Iced Tea 18oz bottles are perfect for smaller spaces. All of these bottles are made of thicker plastic and hold up very well. We use them almost weekly for grocery shopping expeditions. Soda bottles work well too. You can also freeze water in quart sized Ziploc freezer bags or the 3” thick Ziploc rectangular containers. I’d prefer the containers over the bags. The flat ice blocks can come in handy when layering items in the cooler. Remember, water expands when it freezes. Do not fill bottles/containers all the way to the top - leave some room for expansion. Looking for your first cooler? Looking to add another one to your collection? Here’s a few sites offering their reviews of different brands/models. How long can I keep foods? Pack Your Cooler Like a Gluten-Free Boss. Now that you have a cooler, you need to know how to pack it correctly. Here are some tips. Wash it before & after using. These guys usually are stored in the basement, in the garage, under the crawl space, in the attic. They can be hot and dirty. If they’re not clean and dry, the inside can get funky. No one likes Cooler Funk. Pre-chill the cooler with ice and water mixture for a few hours before packing; this will ensure the cooler is chillin’. Discard the pre-chill ice bath. Don’t pack room temperature or warm items. These items make the ice melt faster, plus it takes a long time for them to get cold. Make sure everything you pack in the cooler is already cold. For most food, it’ll be coming cold from the fridge or the freezer, but for things like beverages - it’s best to pre-chill them - just like the cooler. Store foods in air/watertight containers. I mentioned this above, but it bears repeating. You don’t want cooler water seeping into your food. Ewww, just ewww. Tupperware brand containers are supposed to be the cat’s meow for this type of storage. Canning jars with the rubber-ringed covers would work too, but they’re glass and have the potential to break if dropped. Place ice (whatever form you use) on the bottom of cooler. Place the perishable foods - those that need to be kept cold the most (pasta/potato salads, meats, dairy, eggs, etc.) closest to or directly on the ice. Build layers of ice/food/ice using those flat rectangular containers or Ziploc bags containing ice. Items on top of the cooler should require the least amount of cold. Keep the lid closed of your food cooler as much as possible. Have a separate beverage cooler if you have the room. A smaller one to keep a couple of bottles of your favorite beverage. It’ll help you stay out of the food cooler. A full cooler stays colder, longer. If you start to run low on items in the cooler - add nonperishable foods, or even a blanket to take up space. Keep the cooler out of the sun. Keep the cooler inside the car where there’s air conditioning - not in the trunk. Always check your destination for the nearest local support group. They’ll be able to direct you to places to shop and dine. A few resources to help narrow down your dining selections. Always ask questions and use your best discretion when dining out. If you’re not comfortable, politely leave. 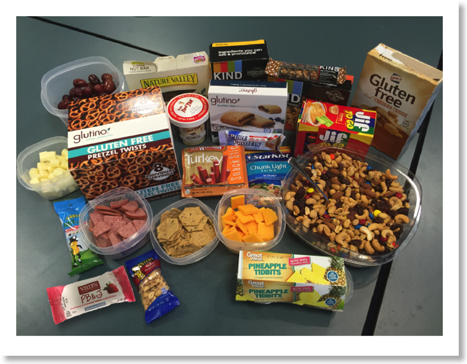 Repackage your dry snacks just like your cooler foods. Airtight containers will keep them fresher, longer (assuming they last before you get 50 miles from home). Keep all snacks in a clear tote bag or container of some type. You’ll always know where they are and you’ll be able to see which container to grab. In the same container keep some paper towels, wet wipes, or a damp washcloth in a ziplock bag. You’ll want to wash those paws after snacking. Salt/pepper/seasonings goes in the same container. Eating utensils - disposable or non disposable - your choice. Couple of kitchen knives - paring and steak knife. Hopefully these hints and tips have inspired you to plan your next great gluten-free adventure.